On Friday Bayern and Hamburg confirmed yet another open secret of German football. The 19-year-old striker Jann Fiete Arp or simply Fiete Arp has signed a pre-contract at Bayern München and will join the club either in the summer of 2019 or the summer of 2020. “The 19-year-old striker will be able to move to Munich as early as summer 2019, or he’ll become an FC Bayern pro in the 2020/21 season. The decision as to when he’ll leave Hamburger SV will be made solely by Arp,” the official statement on Bayern’s homepage read. “He’s a very good player. Bright prospects need to be transferred as quickly as possible. Otherwise, there are others who would come in for them. You must invest in players for the future. I’m sure he’ll be a full Germany international in a few years,” Niko Kovač said after the transfer was officially announced. “I have nothing to do with the transfer. I didn’t come before the summer, and I don’t know when the club got in contact with HSV and the player,” Kovač added. The last statement, in particular, highlights Bayern’s plans with Fiete Arp. The striker is a long-term project, a player that comes with plenty of promise and with a pedigree of being one of the brightest attacking talents in Europe. At the same time, there is also the baggage of having been relegated with Hamburger SV last season — for the first time in the club’s history. Already at that point, there were rumours that Bayern could sign the striker right away in the region of €5 million. It was money that Hamburg needed, and still needs, in order to secure to recover from years of financial mismanagement. Those who had watched Fiete Arp last season, however, will note that, although talented, Arp was about as much removed from being a Bayern player as Hamburg from the Champions League. Last season during Hamburg’s, ultimately futile, relegation battle Fiete Arp was quickly identified as the club’s biggest hope. The then 18-year-old had been brilliant for Germany’s U-17 scoring 18 goals in 19 games, including five goals in five U-17 FIFA World Cup games. The jump from junior football to the Bundesliga, however, is a big one and in 18 games last season Fiete Arp managed just two goals in 18 games. Nonetheless, he was the first Hamburg scorer in history to be born after the year 2000. In fact, Arp started spectacularly into his Bundesliga career scoring two goals in his first three games. Then reality hit home. Like the rest of the squad was entangled in the relegation battle. Following matchday 27 he played just 37 more minutes as Hamburg came close to fight off relegation. What followed was the clubs first ever descent to the second division and rumours about Fiete Arp joining Bayern. Ultimately, Fiete Arp renewed his contract. But most in Germany realized that the new contract only postponed a transfer to Bayern. In fact, many suspected that the new contract was simply a parking deal that allowed Arp to develop at Hamburg before making the step to Bayern. “The negotiations with Bayern were always open and fair. 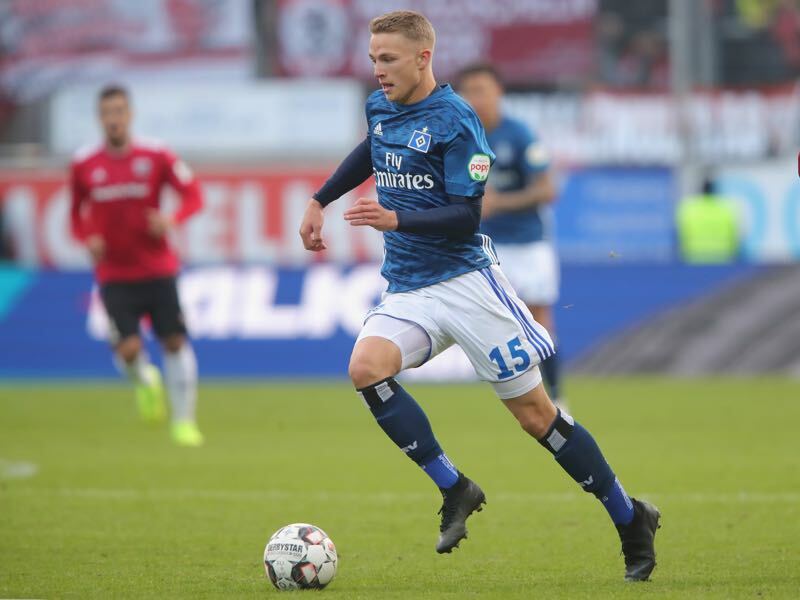 It was important for Fiete Arp to help the club return to the Bundesliga. It is a goal that Arp puts above everything, and that won’t change in the future,” sporting director Ralf Becker told the media following the announcement of the deal this week. Nonetheless, the deal raised some eyebrows in Hamburg and Munich. First of all, there is the fact that Arp decides when the deal will be completed. Furthermore, many Hamburg fans felt a sense of betrayal that Fiete Arp had renewed his contract but that Hamburg had failed to communicate that the new contract only postponed a transfer to Bayern. “In retrospect, the decision to not communicate the transfer may have been a mistake,” HSV CEO Bernd Hoffmann told the German magazine kicker on Saturday. “But that was not Fiete’s decision,” Hoffmann quickly added. “We know that Fiete is aware of the responsibility that he carries with being able to decide on when to move to Bayern,” Hoffmann further said. “We are in constant communication with Arp and will find a good solution, but a decision will not be made during the season,” Hoffmann added. Hoffmann also said that the €2.5 million Bayern would have to pay have not been transferred yet. “Bayern always pay on time once they are billed. But that money cannot be used this season,” Hoffmann concluded. For Hamburg, therefore, money needed for financial survival will not be available right away. For Bayern, in the meantime, it is a deal with very little financial risk. “That sort of money is nothing,” Germany’s Sueddeutsche Zeitung pointed out in their story on the transfer on Friday. Fiete Arp, in fact, is one small puzzle piece in Bayern’s rebuild and future transfer strategy. Together with Serge Gnabry, Kingsley Coman and Alphonso Davies that have all been signed in recent weeks Fiete Arp is the latest young player signed for relatively small money. One price category above that will be Callum Hudson-Odoi, who remains a transfer target for Bayern despite the failed transfer this winter. Also on the list is Kai Havertz. Sueddeutsche speculated on Friday that it would only be a matter of time for the 19-year-old attacking midfielder to join Bayern in a deal that could break records in Germany. Furthermore, it is unlikely that Fiete Arp will be the only striker signed by Bayern. Timo Werner remains heavily linked to Bayern among German football circles, and it is even whispered silently that a deal between Bayern and Werner has been long agreed. It would not be the first time for Bayern to get a deal done quietly — see Serge Gnabry, Leon Goretzka or Fiete Arp. What does that mean for Fiete Arp? Heading to Bayern was always going to be a risk for the 19-year-old striker, whose potential seems limitless at the moment. But the limitless potential is not enough, after all the list of failed strikers at Bayern is long and includes names like Lukas Podolski. Hence, with this in mind, Arp needs to make the next step at HSV where he has not scored in 11 Bundesliga 2 games this season and has even been delegated to the Regionalliga Nord team at times. Observers are certain another season at Hamburg, ideally in the Bundesliga, would be ideal, because only then could Arp become an important of Bayern’s generation next.